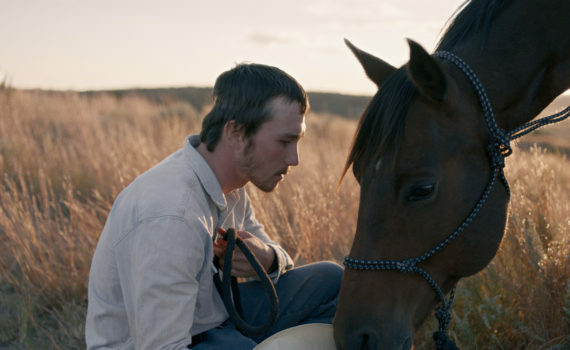 The Rider was recommended to me as one of the best films of the year, an organic and windswept drama with a Western flare that has the power to capture hearts and then break them, cowboy style. Its unique claim to fame is that it utilizes amateur actors, going for authenticity over pizazz, roughnecks over a-listers. Color me surprised, but that mostly works, having non-actors playing the parts that perhaps only they were born to play. It does set up a few scenes that won’t rise to the level of Daniel Day-Lewis on a soap box, but how many genre films and individual talents can reach that height anyway; perhaps it’s best not to try at all, to do it your way, if you know the end result would just disappoint. Brady Blackburn is a rodeo cowboy, and that’s all he’s ever wanted to be. He rides horses, he trains horses, he talks to horses, he understands horses; really, other than a few friends, he much prefers them to people. But after a freak accident under the hoof of a bronco, Brady has to stop the passions that drive him and settle for a completely different, much more boring life. He can’t ride, definitely can’t compete, and all that’s left to him, with not even a high school diploma, is to work and drink and become his old man. That doesn’t sit well, and he’ll push the boundaries of sense in his quest to return to the saddle, to get back to the man he once was and to find the dream he once held tight. I trust the opinion of the friend who recommended The Rider to me, we both love Westerns, and he was right about the power of this film, as it hits all the right buttons at all the right times to become something special, at a time when originality is definitely at a premium. Brady is just a kid trying to find something to live for, and that’s all of us, rodeos and lassos and stirrups aside. We relate to him because we’ve all been knocked down, and getting back up is about the hardest thing we’ve ever had or will ever have to do. The inexperienced actors did bother me a bit, especially since that’s the single most important aspect I look for in a film, the quality of the cast and their performances, but The Rider is just different enough to earn a pass for its amateur status; it really mostly works in its favor. And the cinematography, wow; words weren’t needed very often, because the landscape spoke for itself, and the relationships that were evident between the land and the animals and the characters and their passions was something to experience. I’ll always choose a phenomenally-acted drama with clever writing and perfect appeal, I think most audiences would, but this film has something unusual to offer, and you’d be making a mistake if you didn’t take it.